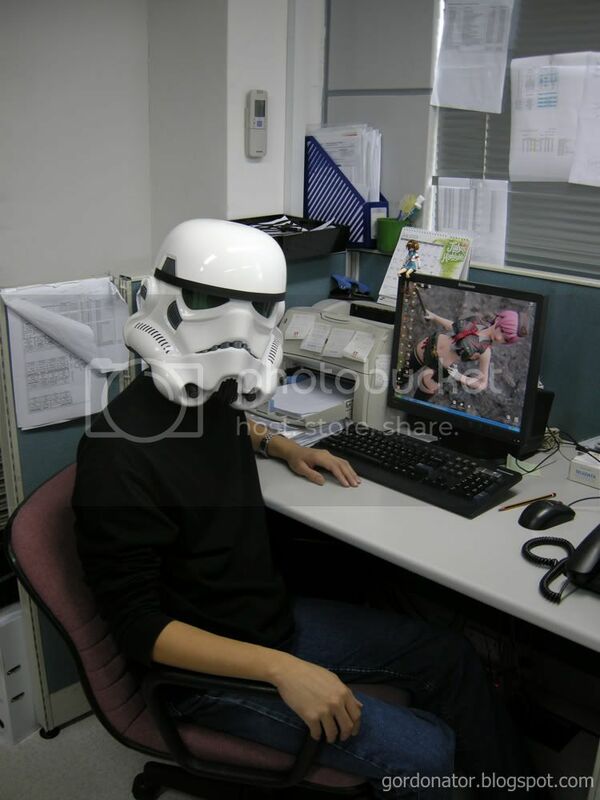 This is me and how the typical stormtrooper’s workstation looks like on board the Death Star. It seems that some Stormtroopers do have a desk job inside the Death Star instead of just running around hunting Jedis.. Yes, and Stormtroopers use Windows XP. I bet the Death Star blew up on its own due to BSoDs. I’d rather a desk job than getting mauled by Jedis. Speaking of Stormtrooper, how was the stormtrooper welcome party last saturday? Can you really see through that helmet? or my eyes are playing tricks on me? maybe a resize to the photo somewhat like smudge that area? or a harsh flash? great stormtrooper use XP? first i thought they proably have something hi-tech. yup. lots of admin works to do. got to come up with the Death Star maintenance report to vader next week. XP aren’t that bad compared to Vista and ME. at for wearing my helmet to work. nope. i have my own room. no one was around except my partner who took the picture. sure can. but without my glasses. it can’t fit inside. u are not the first one to say i have smooth skin. lol. no flash was used for the shot. it’s the best the Empire can ofter. Where was your gun? I bet you used it on anyone who intruded into Empire-owned space. I guess it’s not casual friday for you. You’re wearing clothes and not a harness and diaper. You wear jeans to work? Or was the shot taken on Friday? By the way, thanks for the support for the 4koma idea. Did you link from Danny Choo or C.I.? Clannad ep 24 is still not acceptable, i was wtf when i saw the DVD. ah yes the rifle. still looking for it. if i feel brave enough i’ll wear it to other places. ^^ got your e-mail as well. no one says u couldn’t so do it. lol! are u in the right place? shut up and give me all your money. lol. it’s freaking cold in the room actually. sorry no idea what is it made of. clear green plastic maybe? back to work i shall. lol. I’ve always been yearning for my own trooper costume. Too bad about the cost. And no specs inside the helmet? I’d be bumping into stuff ever so often.